For the past few months, I’ve been working really long hours, and sometimes not even getting home until after 8 pm at night. By then, I’m usually exhausted and starving, so I just buy a bento and eat it half heartedly before crashing to bed. After a few weeks of this, I’m noticing that it’s having such a negative effect on my lifestyle, and I want change! As I mentioned in this previous post, lately, I’ve been trying to make more active use of my kitchen. Even though it’s super tiny, it’s still adequate enough to cook and bake. I thought I would start a new series, “Tiny Kitchen” to document my latest adventures cooking (and baking here). It always helps me to have a concrete (yet realistic!) goal in mind, so my goals are to make dinners at least twice a week for the next month. This pasta is the first in the series, and it was inspired by a box of cherry tomatoes that I received in my weekly fruit box delivery. In Taiwan, cherry tomatoes are a fruit. However, I personally consider them to be a vegetable, and thought they would be perfect for a quick, yet satisfying dinner. A quick search on the internet, and I was in luck. How can you resist a recipe with this description? “Juicy sweet cherry tomatoes burst open in warm olive oil, creating a luxuriously silky sauce that comes together in minutes”. By the way, there is actually a knife by Victorinox, made especially for slicing tomatoes! This knife is one of the most often used knives in my kitchen, so handy for slicing tomatoes, and bread, actually. I used the Epicurous recipe as a rough guide~ I’ve included the entire recipe for you at the end of the post, if you would like exact measurements. Since I only have one burner in my tiny kitchen, I find that it’s always helpful to go over all the steps in my head first. This time, I boiled water, and cooked my pasta first. 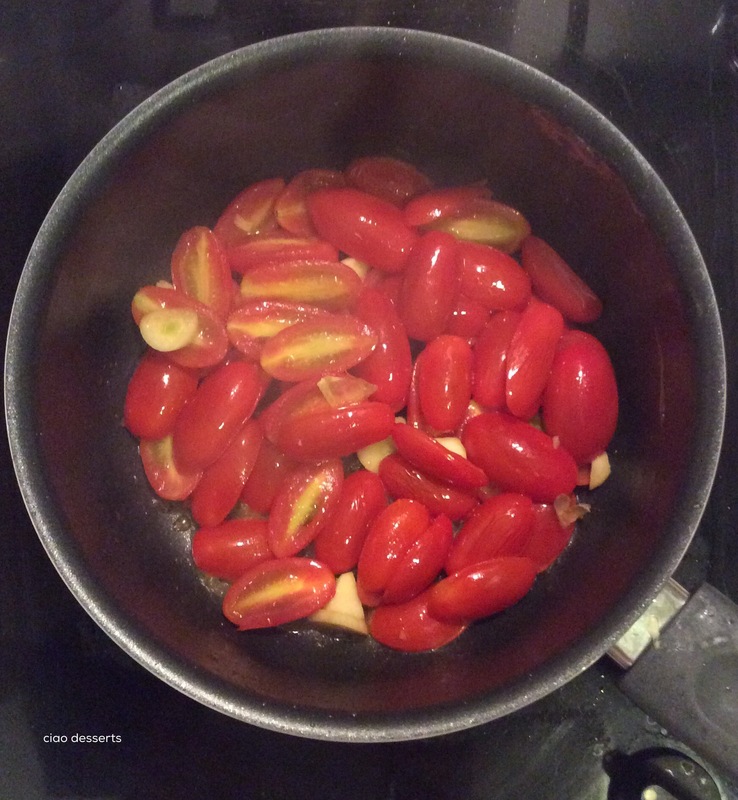 Then I transferred the pasta to a big bowl, and started cooking the tomatoes. Out of sheer laziness, I used the same pan to heat up some olive oil. Then I added garlic, and the sliced cherry tomatoes. In just a few minutes, the tomatoes will start bursting. I added some salt, and a pinch of sugar. Cook pasta in a large pot of boiling salted water, stirring occasionally, drain and transfer to a large bowl. Heat olive oil in a saucepan over medium-high. Add garlic, then tomatoes, pepper, sugar, and 1 tsp. salt. 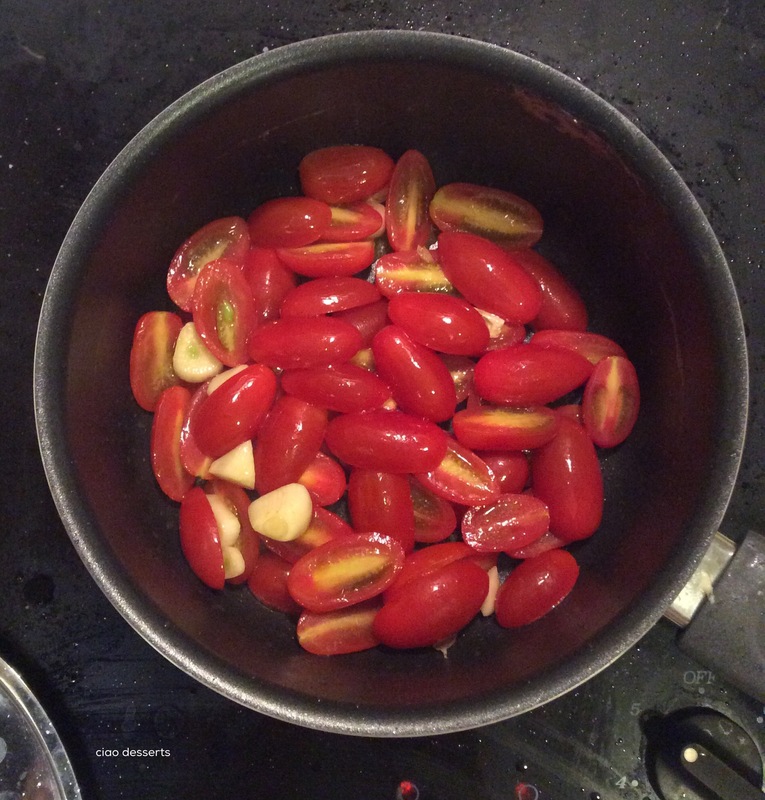 Cook, stirring occasionally, until tomatoes burst and release their juices to form a sauce, 6–8 minutes. 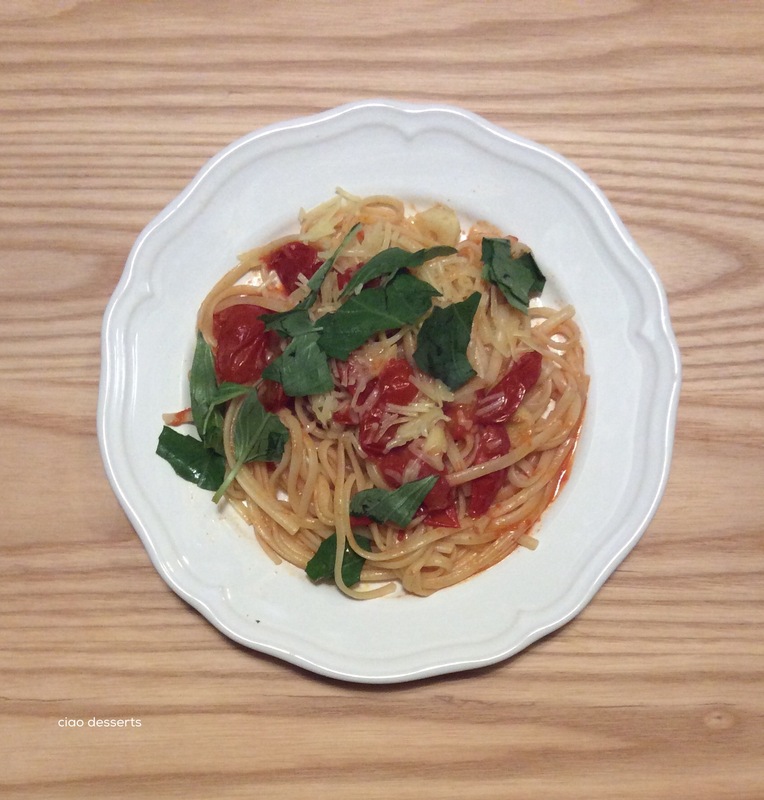 This entry was posted in Uncategorized and tagged Pasta, tiny kitchen, weekday dinners. Bookmark the permalink. To solve the problem of having just a single burner you could try what in English I think it’s called one-pot pasta. In Italian we call it ‘pasta risottata’, which means, pasta cooked the way risotto is. First you prepare the sauce and then you add pasta in the same pot and cook it adding constantly a few tablespoons of water or broth. The result is a very intensely flavoured pasta dish! Hi Julia, thanks for the tip! I’ll make sure and try it next time and let you know how it turns out. Risotto is next on my list… I’ve never tried making it before, so it’s a new challenge for 2017. 🙂 Happy New Year! Dear Chloe, I totally agree! I cook this so often now! 🙂 Happy New Year!